Our new 100% Eco friendly Cotton yoga blankets come without tassels. 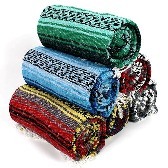 These blankets are soft and durable, and have a heavier and tighter weave than our Mexican Yoga Blankets. The blankets are solid colors. Use this blanket for extra padding, or to lend support for yoga positions when a bolster is too large..
Yoga Blankets may be the most versatile yoga prop. It can be substituted as a bolster when rolled, depending on the blanket one or two provide a stable but yielding surface for shoulder stands, restorative poses and pranayama practice, it also gives warmth under and over your body for final relaxation. We cannot specify colors on this product.